What floats our boat about this flash sheet by the master tattooer, Earl Brown? Maybe it's about the good life. A girl in the bunny suit. Catch a wink and a nod from a lass in a pirate outfit. What's not to like? 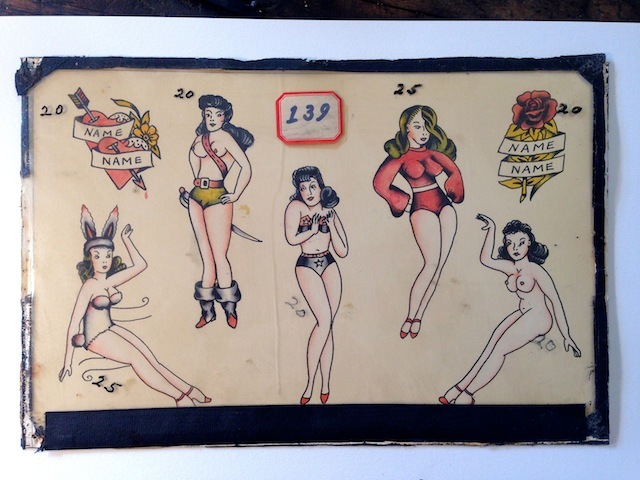 Five seductive pin ups all waiting to add their name with yours on a hearts or roses banner. The elongated "X" compositional symmetry is brilliant. Dead center, a demure raven-haired beauty in a black Wonderwoman bikini. She's bookended by two girls each sitting with a hand up. Look. They are waving. At ME! Are we biggie (Biggie Smalls) enough for the swinging brunette with hairstyle flowing down over one eye? Yes, we nod. Yes, we are. As Dean Martin once sang: I got to get a tattoo at 12:30, don't want to be late. I hugged her and she hugged back. Like a sailor said quote "Ain't that a hole in a boat?"